Order in the next 21 hours and 19 minutes and select FedEx Saturday . Or give us a call at 1-800-625-5468. When the power goes out, the BE600M1 provides guaranteed power for computers, external hard-drives and other electronics, including your wireless router so you can maintain a network connection for your IoT devices when you need it most! When the power goes out, the BE600M1 provides guaranteed power for computers, external hard-drives and other electronics, including your wireless router so you can maintain a network connection for your IoT devices when you need it most! Ideal for the home and home offices, the Back-UPS BE600M1 offers plenty of power and outlets, plus a 1.5A USB Charging port. 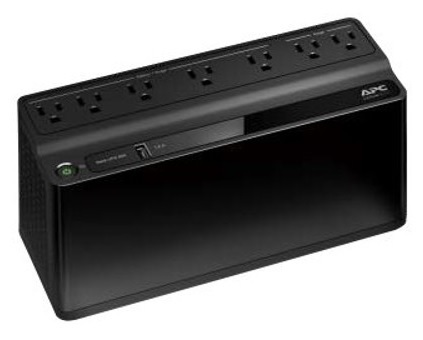 Why use an Uninterruptible Power Supply (UPS)? Watch this short video for insight into the features & benefits of an APC Back-UPS. Every connected SmartHome needs a UPS to help keep your wifi on and available, so that your SmartHome stays, well... smart! Give yourself the time to save documents and gracefully shut down your computer without the harsh impact on your electronics of a sudden power loss. Stay connected via the internet when your power goes out. That wifi signal can still be available if your router is connected to a UPS. Consoles, Gaming PC's, connected hard-drives and your Twitch stream all stay on when the lights go out. Don't lose your DVR recordings when the power flickers. A connected cable/satellite box will continue recording, even when the house is dark.